Like ogres (and onions) quilts are made up of layers. 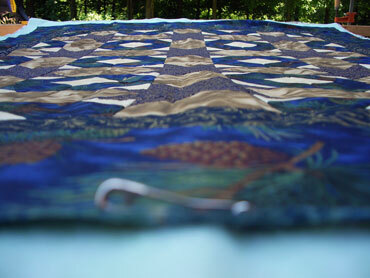 Putting the layers together for quilting can be a daunting task…especially if it’s lap sized or bigger. I know many quilters who spread everything out on the floor but, as I age, that is harder and harder on my back and knees. 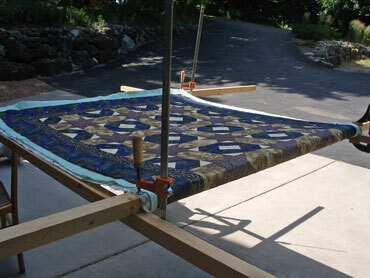 My favorite way to layer a larger quilt sandwich (up to king size) is on a simple frame. I learned how to do this way back when I first learned to quilt and continue to use that original system. So, whether you’re going to baste your quilt together with safety pins or thread, or even if you want to tie it “comforter” style, this frame will work! 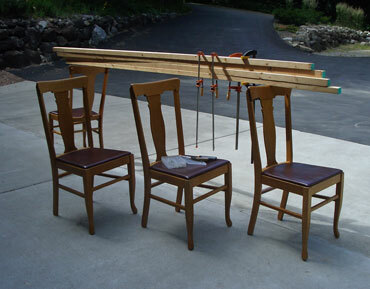 The first problem we usually encounter is where to set up the frame because of the size. 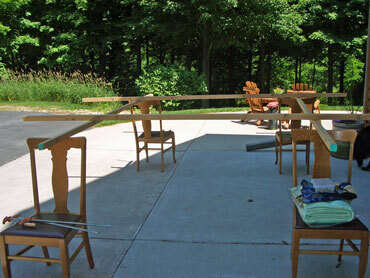 I find it best to set up the frame outdoors if the weather is nice or in the garage (sans cars) if it isn’t. Work across from each other, placing pins at 8″ intervals (approx.) until those 2 sides are done and then repeat for the remaining 2 sides. Repeat for the opposite side and pin away! 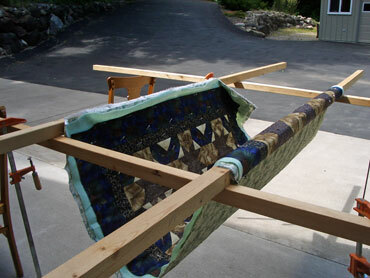 On larger quilts you may need to roll more than once. 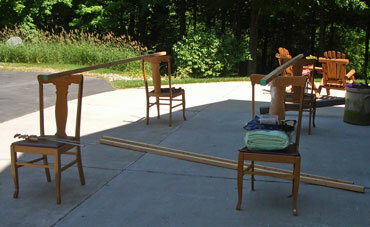 It’s better to roll and pin comfortably than to reach and strain, and possibly knock the whole kaboodle off the chairs! 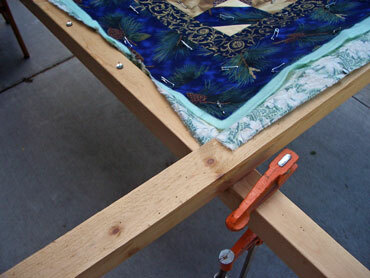 Once the basting/tying is done: remove the clamps, unroll the quilt and take out the tacks. It’s just that easy :-). 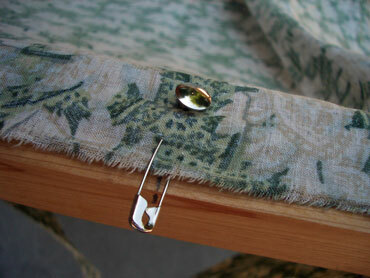 Next week I’ll have some tips for pinning, storing the frame and enticing others to help. I love the pictures. Now I can show my husband instead of trying to explain. As always thanks so much!! Enjoyed your “Shrek on Quilts”! I just finished a Shrek quilt for my grandson that I am ready to “sandwich” together! Couldn’t find any Shrek fabric so I had him color Shrek coloring pages that I then transfered to fabric and made up my own pattern! It turned out really nice. Can’t wait to quilt it. 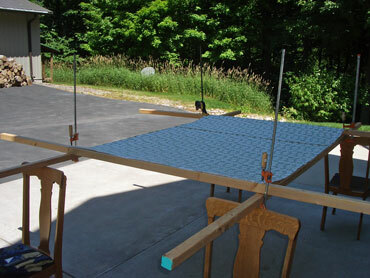 Should be done for the August quild meeting. I always take my quilts to church to lay them out and sandwich them. I like your method too. I love that you showed how to do this. 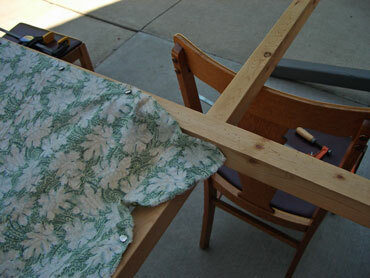 I have my husband’s grandmother’s quilt frame – meaning the 2 x 4’s and clamps) in the basement. 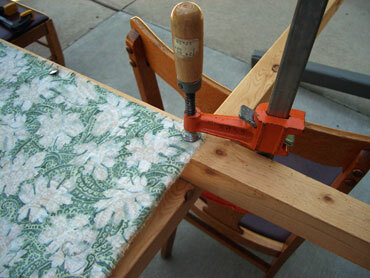 It’s good for the younger quilters to see how it used to be done! And how frugally! Your frame looks just like mine, when I lived in a bigger house my frame had mobile legs to attach. Now in my small house its over the dinning table with the chair system. Go quilters. 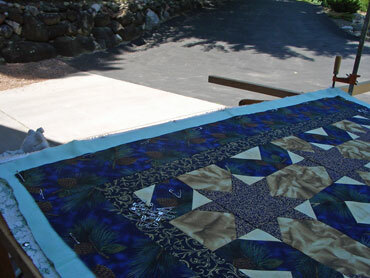 I have really enjoyed your e-mails, with me being a new quilter I am always looking for help. Have a great day.